Trans-Lectures are performative translations. They transform one thought into another. They are also invitations to understand and interpret one reality through another. 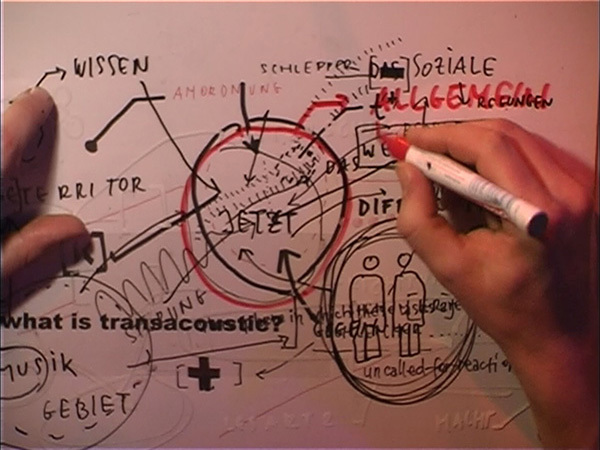 In the last years artist and performer Nikolaus Gansterer developed a series of performances called Translectures – an inter-subjective form of notation and a new vocabulary between the lines of drawing, choreography and performance. 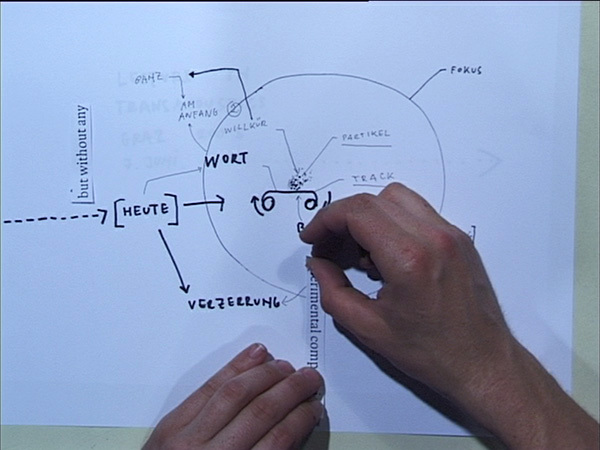 In Tanslectures Nikolaus Gansterer is researching in how far a drawing – for him a medium of high immediacy – can become tool of communication, a score, and again an instruction for taking action. 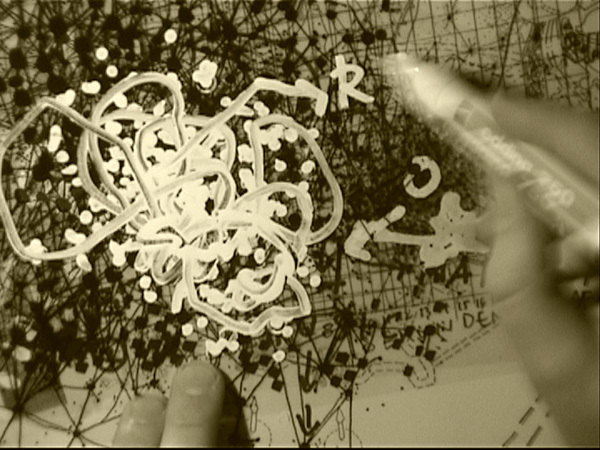 Within his specific performance lecture format Gansterer is interested – often in collaboration with others – how a thought could be extended along the categories of time, space and movement: So to speak, a line of thought could become a line on the paper, could turn into a line in space, or a line verbalized, and then again a line drawn with the whole body. 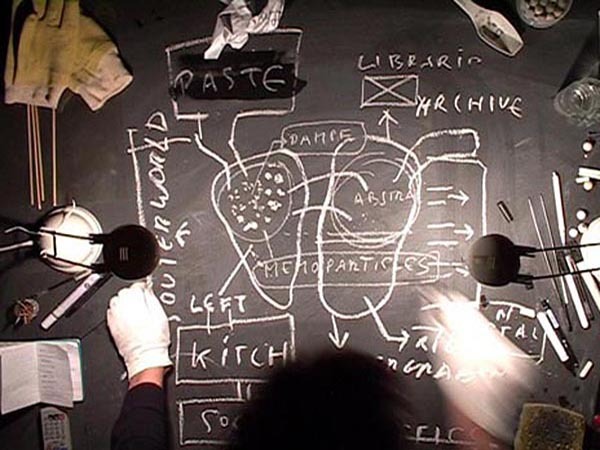 Often Trans-Lecture performances take place in collaboration with authors, poets, theoreticians (TJ's as "theory-jockeys") and other sound- and visual artists aiming to act within the crossover of linguistic as well as acoustic and graphic intersections. 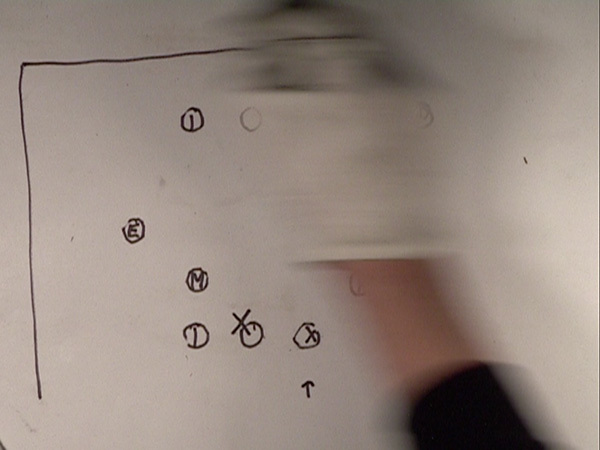 Video serves as an ideal format to document and turn the performance in an autonomous video work. Please browse and click on the side menu bar to watch a selection of audio-visual documentations of Translectures. With contributions by Peter Stamer, Boyan Manchev, Marie-Luise Angerer, Nikolaus Gansterer & Erin Manning, Helmut Ploebst, David Weber-Krebs mit Maximilian Haas, Astrid Peterle, Alain Franco, Micha Purucker, Klemens Gruber, Luke Baio & Dominik Grünbühel, Martina Ruhsam, Clément Layes / Public in Private and Krassimira Kruschkova. – Nikolaus Gansterer in dialogue with choreographer Mariella Greil about the Translecture performances, in: the CORPUS magazine 2014. Please download as pdf (German) or as pdf (English).